Proofs 13 & 14 that the Earth is not flat. 8. "Again, the devil taketh him up into an exceeding high mountain, and sheweth him all the kingdoms of the world, and the glory of them." The only way that all the kingdoms of the world could be visible from the top of a mountain would be if the Earth were more or less flat. 7. "Behold, he cometh with clouds; and every eye shall see him." If people all over the earth will see Jesus simultaneously in the clouds at the time of his Second Coming, then it would imply that the Earth is flat. Otherwise, he would only be visible from a small percentage of the Earth's population in a small area of the Earth's surface. However, the passage could still come true today on a spherical Earth if it referred to people watching Jesus on CNN and other television media that were covering the event. 1. " And after these things I saw four angels standing on the four corners of the earth, holding the four winds of the earth. ..."
This would imply either a flat earth with a square or rectangular shape like a dinner plate, or a cubical earth. A sphere doesn't have corners. We used quotations from the King James Bible because the text is in the Public Domain and is thus not copyrighted. On a clear night, if you live north of the equator, it is relatively easy to locate the Big Dipper constellation (a.k.a. Ursa Major, The Great Bear, or Plough). There are "two pointer" stars in that constellation; they are the stars which are farthest from the handle of the dipper. By drawing a line through the pointer stars and extending it a little more than three times, you should find the North Star, a.k.a. Polaris. It is the first star in the handle of the Little Dipper. It was named from the Latin "stella polaris," meaning "pole star." If you mount a camera on a tripod, point it at Polaris, and open the shutter for a few hours, you will get an image with a series of star trails. Polaris, the North Star, is very close to the center. The other stars will generate images of circular arcs around the North Celestial Pole. A typical result is shown below, with a trail from a jet plane slicing across the image. The important factor to realize is that the stars that generate the apparent arcs around the South Celestial Pole are an entirely different set of stars than are seen in the Northern Hemisphere. The constellations are entirely different. If one were to travel from the Earth's North Pole to the South Pole, the visible stars and constellations will continuously change. 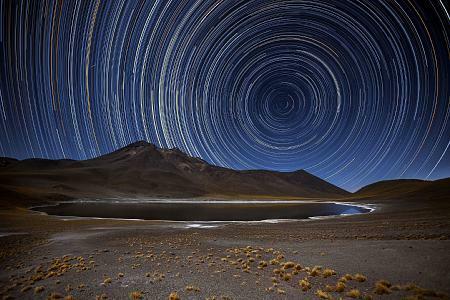 When one moves a sufficiently South of the equator, Polaris remains below the horizon and is not visible. Together, these observations prove that the Earth is roughly spherical, and rotating, with its North Pole currently pointing close to Polaris and its South Pole pointing close to Sigma Octantis. If the Earth actually had the form of a flat disk, then the stars and their constellations as viewed from Northern Canada and Australia would be the same. According to map makers, Antarctica is an island continent with a coastline about 11,000 miles long. The South Pole is located approximately in its center. The left image below shows Antarctica centered around the South Pole. 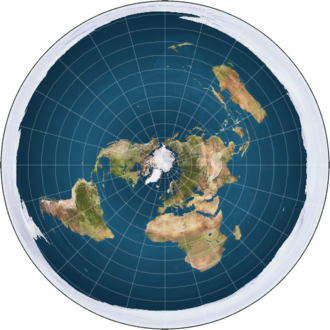 In contrast, according to most flat Earth supporters, Antarctica is a continuous and relatively narrow strip of land that surrounds the continents at the edge of the world. The right image below shows It as a white ribbon around the edge. It keeps the water in the world's oceans from spilling over the edge. As shown, its coastline is on the order of 78,000 miles long. (The two images are not drawn to the same scale.) With such an enormous difference in size and shape for Antarctica, it should not be too difficult to prove which one is correct. 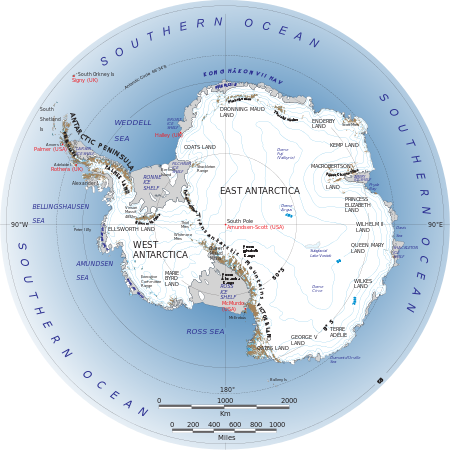 The term "Antarctic" refers to a region that includes the continent of Antarctica, its surrounding waters, and various island territories in the Southern Ocean. A Russian, Fedor Kinyukhov, has circumnavigated Antarctic a few times. On his fourth trip, he set off from Albany, in the Great Southern region of Western Australia, on 2008-JAN-26. He returned to Albany on MAY-09, 102 days later. His trip and its timing were ratified by the World Sailing Speed Record Council (WSSRC). It provides a target for others to beat during subsequent Antarctic Cup Races. The trip is known as the Antarctic Cup Racetrack and is about 14,600 miles in length. 5 That length makes a 78,000 mile Antarctic coastline quite impossible. If one ignores the relatively short distances from Albany, Australia to Antarctic and return, for a boat to cover just the 78,000 miles coastline of Antarctic as suggested by Flat Earth supporters in 102 days would require it to average about 32 miles per hour! The cruising speed of the vessel (Kapitan Khlebnikov) is is 14 knots or 16 mph. With the unpredictable winds in Antarctic, its average speed would be much slower. Part 9: Proofs 15 to 22 that the Earth is not flat. Part 10: Proofs 23 & 24 that the Earth is not flat. Are Flat Earthers Creating a Hoax?